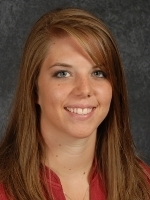 Former Saint and Redskin Taryn Westerman is off to a strong start at Midwestern State. The 5’11” junior had 41 assists in a 3-1 win over Dallas Baptist in Dallas Tuesday night. Westerman helped Seward win a Jayhawk West title last year and helped lead Liberal to a pair of WAC titles in 2006 and 2007. Westerman showed versatility at Seward last year by ranking in the top five for the Saints in kills (95), assists (443), service aces (31), digs (181) and blocks (40). She averaged 0.83 kills, 3.89 assists, 1.59 digs and 0.35 blocks per set and leaves SCCC ninth on its all-time assists list at 936. She was also named to Jayhawk Conference All-Academic Team. At Liberal, she was named Western Athletic Conference Offensive MVP as a senior and was a three-time first-team All-WAC performer. Westerman garnered first-team All-Class 5A/6A by the Hutchinson News after junior season of 2006.